Magic doesn't have to be complicated. 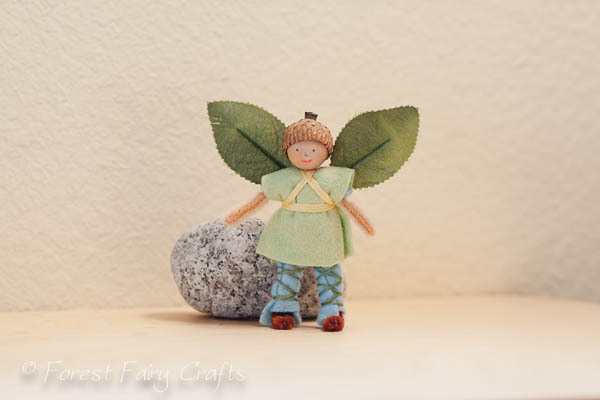 I find simple fairies so charming. This boy is exactly that. I started him with one idea and finished him a few weeks later when I found just the right size acorn cap. We live in an area with many, many trees (the forest :)) and I collect acorn caps whenever I see them. Finding great caps is tricky, though. Many times they are already softened from wet ground, or covered with pollen, or too small... So when I find ones that are just right, I am delighted. When I first started creating fairies, I made girls, girls, girls. Until I brought the project to school and I had to create a simple way for the boys to have their boy fairy. After I perfected the technique, the boys became as popular as the girls. In fact, at our school auction, the boy fairies often receive more bids than the girl fairies. Imagine that! We show how to make the boys step by step in our book, of course. The book went to the printer last week, so we are on target for the May/June release, hurrah! He will probably go to our Etsy shop if I don't donate him to the school auction- I will update if he is in the shop soon. He's a charming little fellow!